What Is: Venous Sinus Thrombosis? Venous sinus thrombosis is in the news now, since Hillary Clinton is currently hospitalized and being treated for it. Most trauma professionals have probably never heard of it, let alone seen one. Here’s a quick primer on what you need to know about this problem. 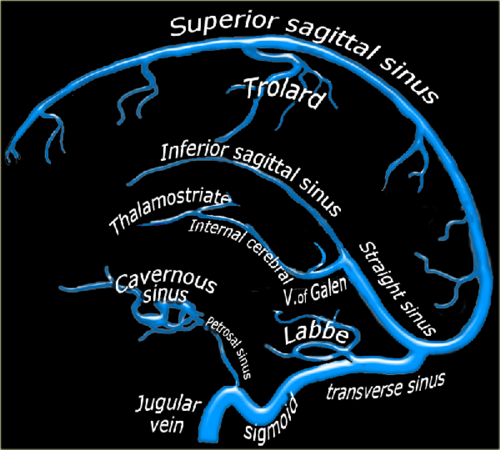 Blood circulation from the cerebral veins drains into the various venous sinus systems around the brain. Additionally, CSF is reabsorbed by the arachnoid villi, which in turn drain into the superior sagittal sinus. A clot in any part of this sinus system (see image below) results in a partial or complete obstruction, which can lead to rapidly increasing pressure in the brain. The condition is very rare, with only about 3 cases per million people recognized. Although most occur in people with clotting abnormalities, trauma is always on the list. The most common traumatic issue is head injury, and almost always involves a skull fracture near the involved venous sinus. Clinically, awake patients complain of a steadily increasing headache that is not touched by any of the usual analgesics. Some describe a headache with very sudden onset, the so-called “thunderclap headache.” Any number of neurologic abnormalities can then occur, ranging from nothing to seizures to rapid onset of coma. Diagnosis is difficult. CT scan unreliably shows the lesion, and subtle venous changes may be overshadowed by findings from the original trauma. However, it should be performed first to accurately diagnose the more common problems that are most likely to be present. If the CT comes up clean, the gold standard is MRI with magnetic resonance venography (MRV). Patients with significant swelling problems may require hyperosmotic therapy and/or decompressive craniectomy. Milder cases can be treated with anticoagulation, but a thorough risk/benefit assessment must be carried out. Remember, these people usually have brain injury that has resulted in bleeding somewhere it shouldn’t be, so anticoagulation can be dangerous! A few rare case reports of thrombolysis (!!) and clot extraction are out there, too, but these are for extreme cases only. Bottom line: It’s likely that Ms. Clinton suffered a temporal bone fracture from her fall, and did well initially like most patients. However, increasing symptoms (headache), likely prompted a repeat CT followed by the MRI which showed thrombosis of her transverse sinus. Luckily, she did not have significantly increased intracranial pressure leading to more serious neurologic problems. Judicious anticoagulation with warfarin and very close monitoring were instituted, and seem to be working well so far. Thrombosis of the cerebral veins and sinuses. NEJM 352:1791-1798, 2005. Cerebral venous sinus thrombosis complicating traumatic head injury. J Clin Neurosci 19(7):1058-1059, 2012.